This TV movie stars Suzanne Pleshette as the embittered widow of a research scientist. Seeking justice, she conceals her identity and goes after the professor (Ed Nelson) she holds responsible for her husband's "accidental" death. Pleshette launches an affair with the professor in order to get the goods on him, but she genuinely falls in love and comes to believe in his innocence. But the professor knows all too well that her husband's demise was no accident. 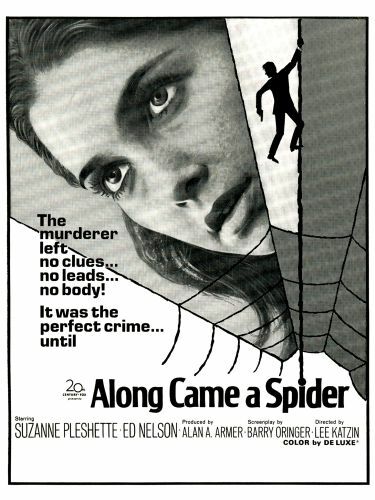 Adapted from a novel by Leonard Lee, Along Came a Spider ran 73 minutes when it was first telecast in February of 1970; it was expanded to 92 minutes when released theatrically abroad.